A “beautiful” molecule, a fine mind and venture capital have combined to form a potential boon to diabetics worldwide. 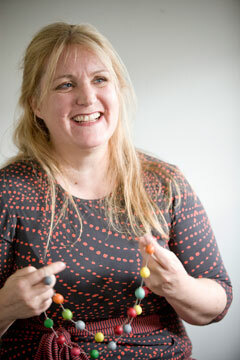 Associate Professor Andrea Robinson is “quietly optimistic”. Pre-clinical trials into an insulin-like molecule she’s developed with her chemistry team and collaborators have gone well – if clinical trials in America follow suit the molecule may be used in medication that could help millions of diabetics. Robinson has been working on the synthetic peptide – a small protein molecule – for nearly six years but says it’s a matter of relief rather than excitement when such a breakthrough occurs. Insulin is vital to the estimated 347million – and growing – diabetics worldwide. But in its natural form, or in the available synthetic form, it’s not heat stable and loses its potency when stored above 4 degrees Celsius – problematic when distributing medication in remote areas of Australia or in developing countries. Her “beautiful molecule” is heat stable to 80 degrees Celsius. The key was replacing a part of the molecule that was unstable – one of insulin’s sulphur-containing bridges – with a metabolically inert “dicarba bridge”. Another important key was securing the funds to further develop the research. Robinson, who worked for a big pharmaceutical company in America as a young scientist, was well placed to do this and successfully gained the backing of the ASX listed drug development company Circadian Technologies Limited. Robinson started studying at Monash in 1985. She developed a “passing interest” in how drugs worked and were designed when majoring in pharmacology and chemistry but it wasn’t until her PhD year and first taste of “owning a project” that her vocation fell into place. The thesis was on the synthesis of a fungal pigment in a mushroom. She was invited to work with big pharmaceutical company DuPont Merck in Delaware, America, after finishing university. DuPont was an invaluable experience as it exposed her to designing bioactive molecules and to making large amounts of pharmaceuticals. Robinson returned to Australia in 1996 when her mother became ill, accepting a position as an academic at Monash. Although becoming an academic wasn’t on her agenda, she knew she could be a science communicator. You only have to watch the YouTube clip (link below) on her work into peptides to see how well she does it. The clip was made not long before the team’s important finding. She spent a decade or so at Monash working on projects involving metal-based catalysts before researching peptides in 2005. She says her team was vital in the recent discovery and is sharing the intellectual property involved with them. Robinson, who is an advocate for, and mentor to other women in science, says she feels a strong sense of obligation to support her colleagues. Her latest challenge enlists the breadth of skills she’s acquired in her career: she was made Associate Dean (Research) in the Faculty of Science in March. The role involves being a conduit to researchers, lifting the university’s research profile and working with the Business Development and Development and Alumni Relations teams to foster connections, including with industry and alumni.